The Bing Channel Partner Awards recognise and reward our channel partners in North America, Australia and Europe who've driven impactful, innovative and performance-driven work with Bing for their advertisers. Every year, we look forward to receiving nominations for the powerful work done by our partners from across the globe. This year, the excitement starts when nominations open on 1 February and will culminate on 30 April 2019, with an evening of celebration at the award ceremony where winners will be announced in Seattle, Washington, followed by the Global Bing Partner Summit on 1 May. The Bing Partner Awards for Channel Partners are an exclusive benefit for Bing Elite and Select Partners currently enrolled in the Bing Partner Program. Through the nomination process, you'll be able to submit your entry for the categories of your choice that best describe your achievements with Bing. All details and best practices can be found on the awards website. Take a look at last year’s winners. Why do partners love receiving a Bing Partner Award? As a Bing Elite or Select Partner, receiving a Channel Partner award can position your company for new business opportunities, generate positive press coverage and can lead to even greater market recognition. As a Bing Partner award winner, you'll be promoted on the Bing Blog and social channels and you'll receive a trophy and digital badge. You'll also have a chance to compete alongside the other regional winners for the 2019 Global Channel Partner Award. Nominations will be open 1-28 February 2019, and the awards ceremony will be held on 30 April 2019. 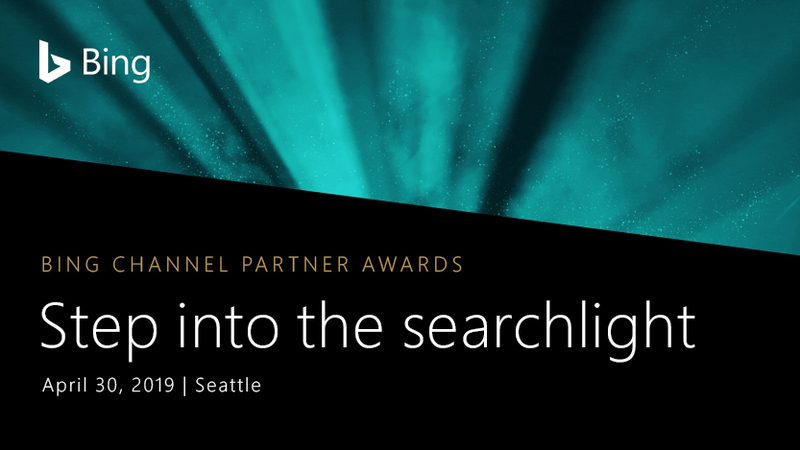 Visit the Bing Channel Partner Awards website to learn more and to prepare your nominations now.